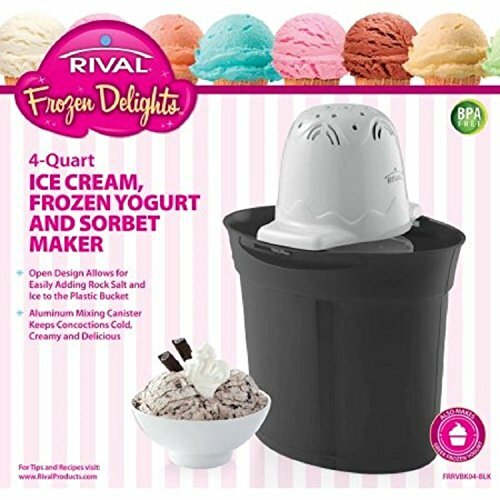 Easy-to-use Rival 4-Quart Ice Cream Maker makes four quarts of homemade ice cream, frozen yogurt or fruity sorbet. An open design allows for conveniently adding rock salt and ice to the plastic bucket, while its fast chilling aluminum mixing canister keeps concoctions cold, creamy and delicious. Add a scoop of fun to anything from neighborhood block parties and backyard barbecues to birthday celebrations and movie nights at home with the kids. View More In Ice Cream Machines. If you have any questions about this product by Rival, contact us by completing and submitting the form below. If you are looking for a specif part number, please include it with your message.